I am an imperfectionist. At times I refer to it as laziness, i.e. not removing the pith from the yuzu when making yuzushu, and while other times I imply a certain creativity. Really, it's a blatant disregard for direction. Even as I read a recipe I wonder if a step is really necessary or if a particular ingredient could be switched with something I have or can easily find in Japan. Even so, despite faithfully-made shopping lists, I change my mind in a flash as I catch sight of another potentially scrumptious addition, and the original formula carefully concocted by professionals and those much more experienced than I is lost. Such is the case with my first ever batch of chestnut liqueur. Spotted on Twitter the concept sounded like a perfect fit with my year of shus. How could I not add this one to my little family of blueberry, rhubarb, plum, and two varieties of ume shus? It was no surprise then that one late October afternoon found me parking my bike in front of a little fruit and vegetable store (yaoya) near the university. I pass it nearly everyday, but almost never stop because I am running late or because my nearby farmstands have filled my larder to the brim. The yaoya owners, an older couple who live upstairs and have a fantastically large (yet small, of course) bonsai forest on their balcony, are often seen puttering about the shop. While she usually rearranges a display, he sits peeling potatoes or, most recently, chestnuts for their customers convenience. It was the latter, of course, that brought me over. 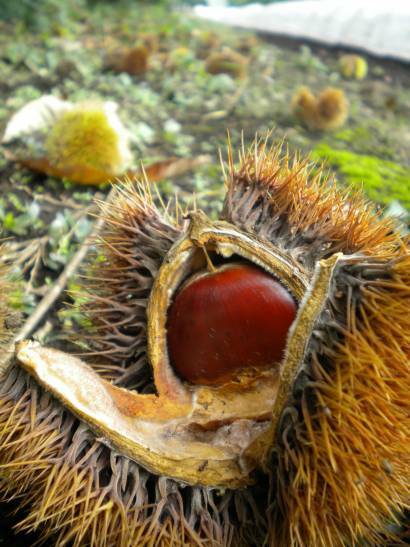 Chestnuts, known as kuri or marron here in Japan, are a distinct flavor of autumn. The rich brown shell gives way to a sweet-fleshed nut that turns golden when cooked. Good steamed simultaneously with rice, the Japanese turn them into any number of wonderful desserts that simply knock the socks off your taste buds. Different from the tochi, these nuts come from a shorter cousin. The kuri don't require as much preparation and effort as the nuts from their taller tochi cousin in order to eat, but are just as delicious. Easily the most tedious part of the process, peeling chestnuts is never much of a pleasure. Knowing the seasonality of the nut is some comfort as are thoughts of the dish to come. I tried Wright's suggested method of boiling and then peeling, but if I do this again I might return to Takashi-san's simple soak-overnight-then-peel concept. It is ultimately less painful physically and emotionally, and I would not be left with a crumbling mass of sweet chestnut flesh. Place the nuts in a jar and pour the water-honey mix over them but through a sieve. Pour the brandy over them and seal up the jar. Wait. *Listed amounts are 'give or take' meaning that while John Wright's original recipe called for a specific number I fudged it to suit my needs. **This number is exact. I wanted the fluid to cover the chestnuts, and so I simply put in the whole bottle. As I mentioned earlier, if given the opportunity, buy pre-peeled fresh chestnuts. Do not confuse this with a recommendation to use canned or precooked chestnuts, though. It might work, but I believe fresh is best to give the liqueur full flavor. Soak the chestnuts overnight to loosen the peels. Doing this is much easier than cooking them as there is a great deal less risk of burns (those solid little things really hold the heat!) or cutting off a finger while simultaneously juggling and peeling. I do remember the chestnuts- roasting - best thing in the world!! They surely are wonderful. I'll let you know how this turns out.